Why won't the EPA regulate ammonium nitrate? Barbara Boxer wants to know. 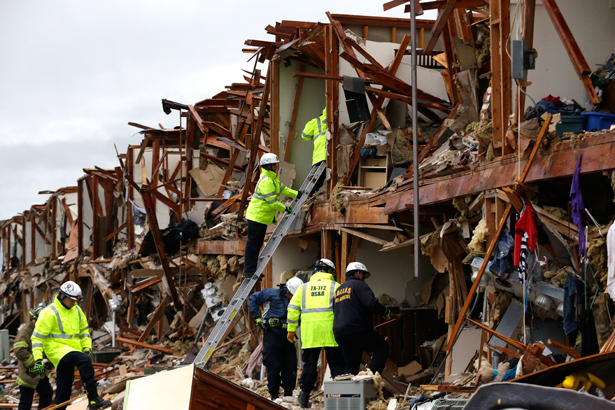 A torrent of troubling information about the massive explosion in West, Texas has emerged since April 19—it’s becoming increasingly clear that the federal regulatory structure failed on multiple fronts when it came to the West Fertilizer Company plant. Tuesday afternoon, Senator Barbara Boxer announced the first formal federal investigation into the tragedy. The Senate and Environment and Public Works Committee will hold hearings soon on what happened in West and how it might have been prevented. 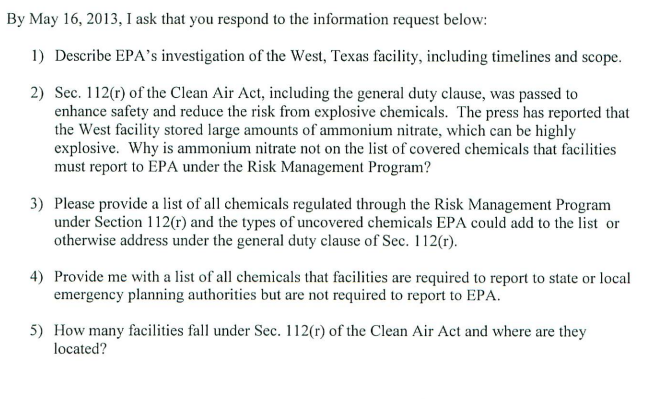 No hearing date has been announced, but Boxer has sent letters to the Chemical Safety Board and the Environmental Protection Agency demanding some very specific answers about what each agency did—or failed to do—before the explosion. The company also did not report its ammonium nitrate stock to the EPA, and what Boxer’s getting at here is that it wasn’t even required to. Even though the Clean Air Act mandated the EPA to reduce the risk from explosive chemicals, ammonium nitrate isn’t on the list, despite being one of the more common explosive chemicals in commercial operations today. It’s also one of the most dangerous—it’s what Timothy McVeigh used to blow up the Murrah Federal Building in Oklahoma City. This isn’t an accident—the Sunlight Foundation reported last week that agribusiness giants have been lobbying the EPA hard not to regulate ammonium nitrate. Since 1998, lobbying disclosures from the Agricultural Retailers Association and the Fertilizer Institute have indicated “safety and security of chemical facilities” as their most frequent lobbying priority. The two groups have spent $2.9 million and $14.4 million on lobbying respectively in that period. Now Boxer wants to know why those lobbying efforts have apparently been successful. It’s good that manufacturers have to disclose their inventory to DHS, but that agency is concerned with whether criminals can get access to the dangerous explosive—not more routine safety issues concerning storage and safety. That’s what the EPA should be doing. The hearings are a useful leverage point for Boxer—she reminds each agency that EPW will convene them soon and asks for answers by May 16. You can bet that EPA and CSB officials will be called to testify. This is a good start, but what remains to be seen is if other Senate commmitees—and their counterparts in the House—will follow suit. The Senate Committee on Health, Education, Labor and Pensions has jurisdiction over the Occupational Safety and Health Administration, which only inspected the plant once since it opened. Meanwhile, House Republicans are planning even deeper cuts to food stamps, George Zornick writes.